Tomorrow, organizers hope to have a climate protest with thousands of students at the Malieveld in The Hague. Although in the Netherlands, in particular, people look at the passion about the climate of which has suddenly flared up in Belgium, in recent times young people worldwide have been on strike for a better climate. They interrupted their school day in Germany, Australia and Switzerland. An overview. First, their joint inspiration: the 16-year-old climate activist Greta Thunberg from Sweden. She is now an icon for young people around the world. As a little girl, Greta was already worried about the greenhouse effect and did not understand why adults were barely mentioning it. Inspired by demonstrations by US American students against the use of firearms, she tried to persuade classmates to go on strike for the climate. The biggest demonstration in Scandinavia was last Friday, on 1 February. Then students went on strike in different cities in Sweden, Denmark, Norway, Finland and even Greenland and the Faroe Islands. 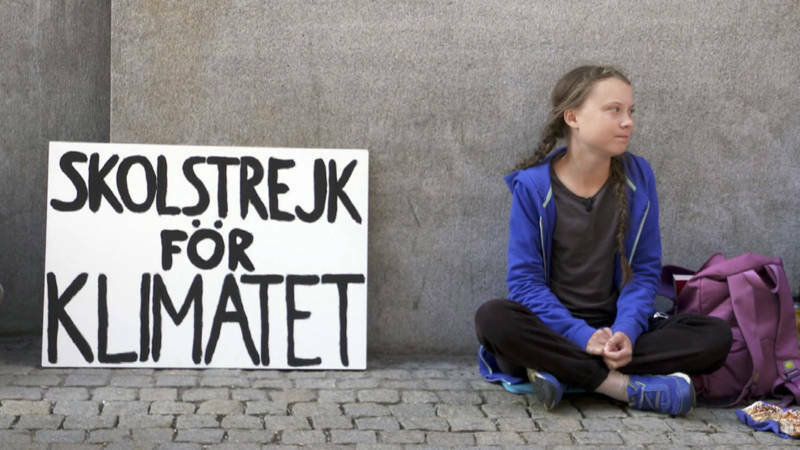 Greta Thunberg stayed in front of the parliament every day during school hours, until the Swedish elections. After that she was only allowed to demonstrate by her parents on Fridays – and she still does. She gave speeches during the climate summit in Poland and at the World Economic Forum in Davos. Now she is considering to take a one-year break from school and to be occupied full-time with climate activism. At the end of November Down Under, thousands of students were leaving their classes to demand action from the government. Greta Thunberg also inspired a lot of students in Germany. “It started with tufts of high school students and university students who canceled their classes on Friday”, says correspondent Judith van de Hulsbeek. “But last week, tens of thousands of students went out on the streets all over Germany on Friday.” Schwänzen, truancy in German, for the climate. The young people first demonstrated on Fridays and skipped their lessons. Last week they gathered on Saturday – so they could go to school the rest of the week. The Youth Climate Strike also includes students on the other side of the Atlantic Ocean. Take 13-year-old Alexandria Villasenor from New York. Inspired by young Thunberg she trudges every Friday to protest at the headquarters of the United Nations. She wants to organize a national strike with a group of environmental organizations on 15 March. “It is still unclear how many students want to participate and how the boards of those schools will respond,” says correspondent Wouter Zwart. One of those students was 13-year-old Holly Gillibrand. The Scottish girl has been organizing her own ‘strike week’ for four weeks in a row. And in Dublin, hundreds of young people gathered in January at the Irish parliament building for the Children’s Rally for Climate Action. In France, most students remained in school, but an online petition demanding action from the government on the climate has been signed more than 2.1 million times. In Italy it is mainly small groups of students who, inspired by the Swedish Thunberg, protest for a better climate. The article mentions that in Thailand there is a call to protest as well. This entry was posted in Environment, Human rights and tagged Climate change by petrel41. Bookmark the permalink. ….this girl – @vanessadantes1 is bringing #ClimateStrike #FridaysForFuture to Africa.